In addition to the roster of 25 extraordinary artists who are creating original, one-of-a-kind sketch cards which will be inserted randomly into hobby packs, Topps is pleased to announce that James Earl Jones (the voice of Darth Vader) and Mark Hamill (Luke Skywalker) have signed cards for the series as well. Both actors signed a very limited quantity of cards. 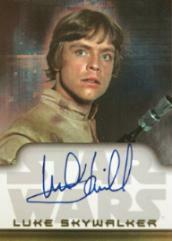 Star Wars Heritage represents the first time Mark Hamill has ever signed for Topps while James Earl Jones signed once before for Star Wars Evolution, a character-based series published by Topps in 2001. Star Wars Heritage contains 5 cards plus one wrapped piece of bubble gum per pack. The suggested retail price is $2 per pack. The product ship date is the week of September 20, coinciding with the release of the first-ever DVD launch of the original Star Wars Trilogy.